How many times in the place now have I declared that I've grown completely done with IPA's only to go ahead and then say "Well, ok, maybe I am but this one is pretty unique/amazing/etc and after it, I am done with the style?" Probably about a billion, right? Spoiler alert here is gonna be that this will make that a billion and one. 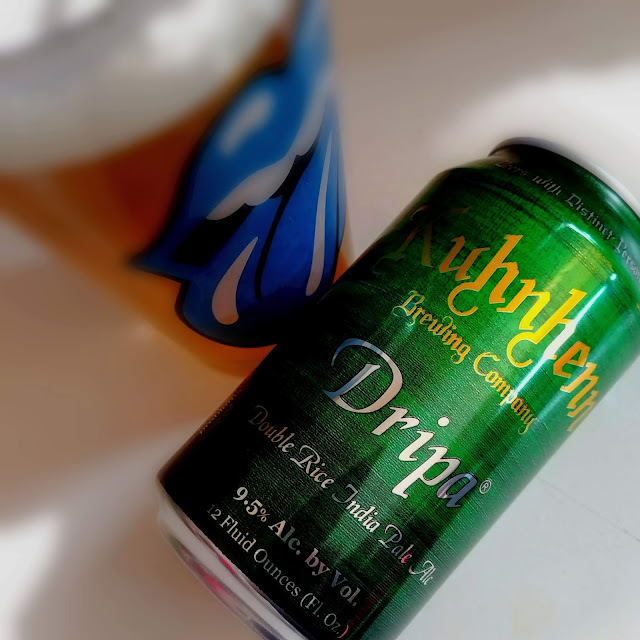 After observing that it pours a rich and hazy golden color with a firm head that leaves a good amount of lacing in its tracks of each sip, the first thing noticed are the aromas this brew gives off. Bright floral notes, a lot of citrus zing and, when given a deeper whiff, is that stewed apples I am thinking. The hop profile comes on strong at first on the sipping side. It is one of a slightly different character though, bold but not as blustery. Mellow orange and lime nuances rather than sticky pine oil or grapefruit stings. A slight dent of dankness hangs so lightly as it is kept calm by slight touches of caramel, honey and cheesecake. There also seems to be some sake flirting going on here, which is probably the rice coming into play. The finish of this medium bodied brew is peppery and bright. The 9.5% abv is quite mighty though it is highly disguised underneath all the interesting balancing of flavors going on. I can attest that these sneak up on ya.